On 30th anniversary of Armenian earthquake, alumnus and donor recognized by ambassador for service as disaster responder | FIU Foundation, Inc.
Spitak, Armenia, in the wake of the 1988 earthquake. Photo courtesy of the BBC. See more here. On December 7, 1988, a magnitude-6.8 earthquake rocked Armenia, leaving 25,000 dead (with estimates ranging as high as 50,000) and hundreds of thousands homeless. 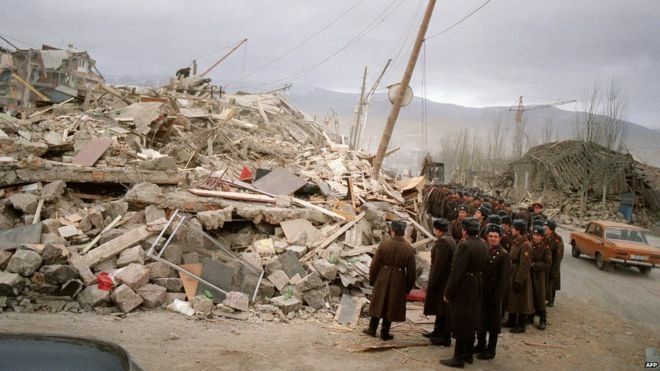 In an unprecedented move, the Soviet Union, of which Armenia was then a member, called for help from the international community in the wake of the disaster. Days later, alumnus Raul Chavez, a now-retired member of Miami-Dade Fire Rescue (MDFR), found himself en route to Spitak, an Armenian town leveled in the disaster. He was part of a highly trained and well-equipped Urban Search and Rescue (USAR) team from the United States, comprised of members from MDFR and Fairfax County Fire and Rescue Department. The team’s effort would become an example for how today’s USAR teams operate in disasters. Chavez himself, now president and CEO of RAC Training Consultants, has trained first responders in communities all over the world. “Thanks to our intervention with the assistance of USAID, we became the front runners of urban search and rescue response and training nationally, if not in the world,” Chavez says. Last month, Chavez represented MDFR in Washington, D.C., at a special ceremony at the Armenian embassy commemorating the earthquake’s 30th anniversary. That day, embassy staff laid a wreath at the Armenian earthquake memorial on the lawn of the American Red Cross headquarters. Armenian Ambassador to the United States Varuzhan Nersesyan thanked Miami-Dade and Fairfax County departments for their service and presented them certificates of appreciation from the Ministry of Emergency Situations of Armenia. Chavez earned a bachelor of science in health services administration from FIU in 1980. He and his wife, Angela Martinez, Ph.D., remain heavily involved with the university, including making significant gifts to the university in support of the future construction of the FIU Alumni Center at MMC. Martinez is also a member of the FIU President’s Council and an active advocate for FIU’s Fostering Panther Pride program, which supports former foster care and homeless students at the university. For their dedication to FIU and the community, Chavez and Martinez were awarded the FIU Medallion–Cal Kovens Distinguished Community Service Award, one of the highest honors the university can bestow. Duane Wiles, executive director of the Alumni Association, extended congratulations to Chavez for his recognition by the Armenian embassy.